Much of the demolition work in the former Dayton’s store in downtown Minneapolis is almost complete with the property’s owners currently seeking building permits to begin rehabilitation work on the inside, according to plans submitted to the city’s Heritage Preservation Commission. 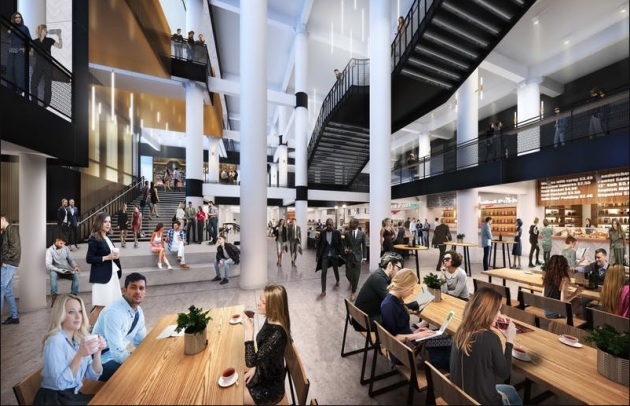 Developers are transforming the former Nicollet Mall department store into a modern office building with retail space on the lower level and first two floors. Owner 601W Cos. is seeking historic tax credits as part of the project and is in the process of requesting the property to be designated as a historic site. There are also still some question marks about several key design features. The storefront design has not been finalized. The uses of the auditorium on the 8th floor and the former Oak Grill restaurant and Skyroom both on the 12th floor have not been determined. “These spaces will remain ‘as is’ until a tenant or landlord use is identified,” wrote staff from PVN, a Minneapolis firm that helps manage and coordinate historic preservation projects. Office tenants have yet to be announced for the project. During the summer, workers changed the configuration of the artificial walls in the skyway level of the former department store so that work could begin to create large openings between the basement, first and second floors for a large atrium. Historic, double-hung, wood windows at levels three to five are being retained. There are more than 200 steel windows that are also being rehabbed. The Skyroom’s windows, which are fixed and not operable, are generally in fair condition and will remain and be cleaned and repaired where necessary. Floor seven will have amenity space as well as tenant space. A small addition on that level is being removed to make way for the “winter lounge” amenity space for tenants.